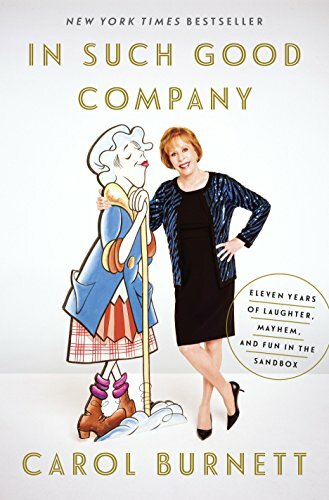 The subtitle of In Such Good Company is Eleven Years of Laughter, Mayhem, And Fun In The Sandbox. Reading Carol Burnett's account of those eleven years was a wonderful journey back in time with pauses along the way to remember and laugh again at the wonderful antics of the Carol Burnett Show. The book is sort of a collection of vignettes and stories of the main stars as well as the guest stars of the show. Who could forget the hilarious situations Tim Conway or Harvey Korman created? Case in point: the elephant story. It's on YouTube if you have forgotten or just want to get a good laugh again. Burnett tells how she came to meet and eventually hire Vicky Lawrence for the show. Did you know Lawrence was only seventeen when she came on board? She goes on to tell how the character, Mama, evolved. She speaks well of all but one of her guests but it's easy to tell which ones she enjoyed the most. The only guest she had a really difficult time with she leaves unnamed. Good for her. In a time when people love taking pot shots at others, she took the higher road. The book is slightly disjointed but the memories are golden. If you were a fan of the show, you will enjoy reading the behind-the-scenes and reliving the skits. It has me wanting to go to YouTube and search for more to watch again. Good book for the road especially if you are only going to have snatches of time to read.